The links below are intended to help you have a resource for you to get started on your own reseach about the various technologies related to the Dimensional Management Lifecycle and Model Based Definition. As I learn of more resources, I will add them to the list. So, come back to see more in the future. Know of another useful link? Please feel free to add suggested links using the Contact Us form. I will personally review the link and add it to the list if appropriate. Applied Geometrics, Inc. -- A strategic partner with CrawfordDM for GD&T Training and Consulting. GD&T traininng videos and texts available at AGI. VSA Datum at Virtual Conditon with Refinement -- PLMWorld 2008 with Mark Foster of Applied Geometrics, Inc. The links provided are for information purposes only. Unless otherwise specifically specified, Crawford Dimensional Management does not retail or otherwise promote software with any direct financial benefit involved. 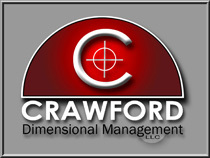 Crawford Dimensional Management does not guarantee any functionality or accuracy of any software. Crawford Dimensional Management, LLC does have a strategic partnership with Applied Geometrics, Inc. for GD&T training, consulting, and related materials such as videos and text. This partnership does have business benefit for Crawford DM.. Links to purchase ASME standards go directly to the ASME.org website for purchase direct from ASME. Crawford DM does not receive any financial benefit from these purchases. Siemens Teamcenter, NX, PMI, VSA, Tecnomatix, Solid Edge -- are trademarks of Siemens Product Lifecycle Management Software, Inc.
SolidWorks is a trademark of Dassault Systems SolidWorks Corp. Copyright 2014 Crawford Dimensional Management, LLC. All rights reserved.